On Friday the 18th, I had a chance to drive around again looking for the Fall colors. Here we are, over halfway through October, and there still is a fair amount of green still in the trees, but in other places, some of the trees are already bare. All these shoots were taken using my Canon 18-55 IS using both two Tiffen Neutral Density filters (1.2 & 0.9) at f22+ for 15 to 25 seconds. Because of some scheduling conflicts, I was able to spend the afternoon doing some photography along Creek Road in southern Glenmoore, Chester County PA. The parking lot was the same one I used during my summer venture, when the heat was 101°F, and I thought I was going to pass out, but I managed to survive, and even post a few pictures along with my blog entry of said adventure. Initially, I went to the right (south) as I did in the summer, but this time my intent was to go further down creek, beyond the picnic bench that I had seen during the summer. This time, the bench was still there, and I quickly walked past, and to unknown territory. As I walked along the trail, the water began to descend to my left, as the path continued horizontal. There was a thick brush line that separated the dissent to the creek, which was going to be all that harder. I must find a path down. It was good to see, that this trail had been used heavily before, but in a fairly limited fashion recently. There were several fallen trees, and the low to mid weeds and brush, were an easy brush back as I walked along. I also noted, that from the trail at least, things seemed still very green on certain trees in the area. There were patches of colors but tended to be in the brush group of foliage. 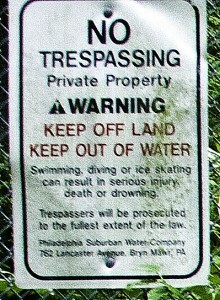 Across the creek, I could see more interesting colors, but as I reached the water’s edge, I could see signs that said quote “Do Not Trespass”. As I surveyed the creek in front of me and how things were flowing, I started back up-stream, taking the occasional single image as just a keepsake of my adventure, and eventually I was walking pass the picnic table, and to the trail head from which I started. I decided to head further North up the trail, and see what I could find. The trail eventually opens up into a small little field where there are several other picnic tables and a fire pit or two. 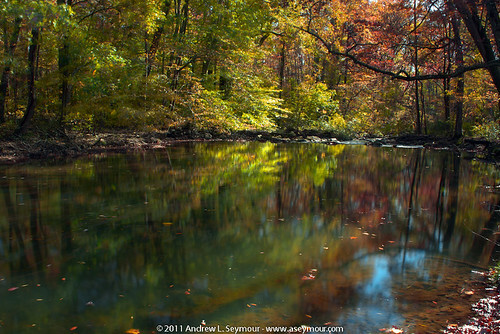 In this area the creek slows down just enough that I saw some good reflections and I was beginning to see some color. 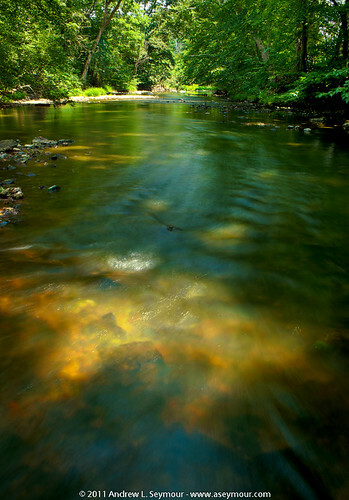 I continued walking north along the creek’s edge, stopping several times and capturing five exposure HDR images. Several times I found myself knee-deep in water, and I was reminded that the colder months are coming, and I need to seriously investigate some fishing waders. Finally I got to the northernmost point along the trail, and was faced with more “No Trespassing” signs, at which point, I looked at my watch, and started heading back. It has been a very mediocre year for leaf colors in my opinion. A lot of rain and warm temperatures have definitely not helped. The lowest temperature lately has been 45°F. 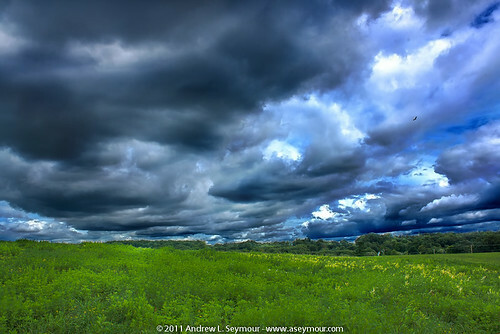 I had to stop at home to grab my gear, and I also jumped on Google Earth to get a quick idea of areas I wanted to check-out with the clouds being as inspiring as they were! My first stop, was just East of Shamona Creek Elementary School, which is rather close to where I live, and having just photographed a similar scene just over two weeks ago, I knew that there was a nice overview both North and South. The biggest thing that you notice missing, is the big bails of hay, which were one of the focus point in the previous Black and White image conversion. From this scene, I walked across the street and up a small hill to capture the next image, and I am very happy to have been able to capture one of the birds that was out souring with the various up-drafts. Backing up again, I continued West down Dorlan Mill Road to Creek Road (Rt. 282). For those that have been following my blog closely, yes, this is the same Creek Road I explored on a Friday in the 101°F heat earlier in July, and very thankfully, it is much cooler this time! 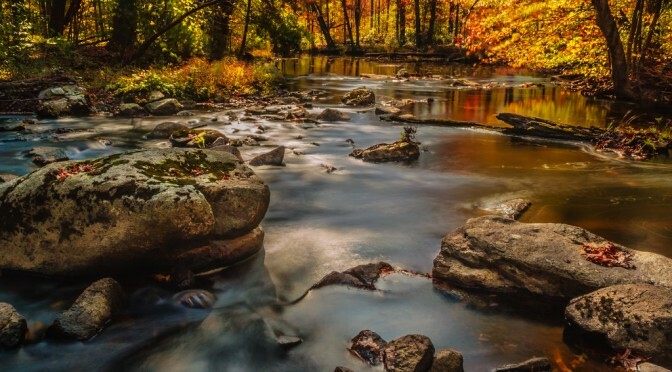 As I drove North West on Creek Road toward Glenmoore, I looked at the Brandywine creek, making metal notes of how the water has risen some, and where I want to explore in the up coming months. I took a couple of different angles on this, and as I was, an adult heron fly from right to left in this image, and disappeared into the woods behind the cat-o-nine-tails. Jumping back into my car, I continued toward Elverson on Creek Road, crossing Manor Road (Rt. 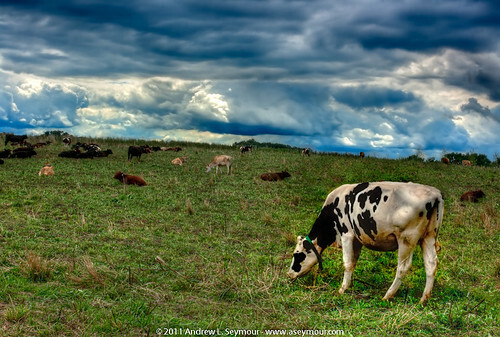 82), and as I started up the small hill, I noticed a group of cows, laying on the ground resting with wonderful clouds in the background. I quickly turned around, pulled over, and grabbed my equipment. My fear as I approached the fence, was that all the cows were going to get up and head toward me. But alas, the cows seemed content to stay were they were, and I was able to click a few frames before my camera just stopped working. 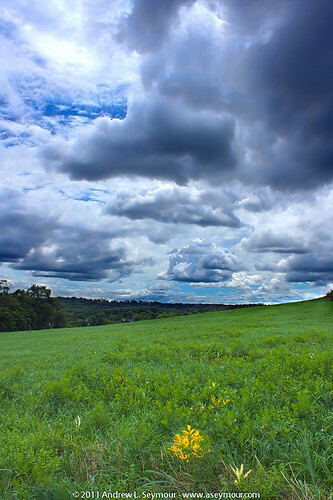 I wanted to continue, so I headed home to grab my AA battery pack, but by the time I got there, and back out my car, the clouds had changed into pending rain, which the area needs, but is no where nearly as interesting as it had been. I called it a day, and started the process of transferring my images from the camera on to my computer for further processing. 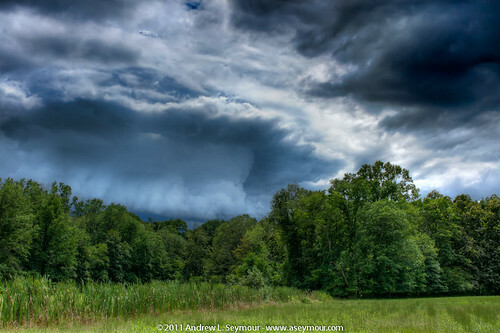 After working on the second image, “Cloud Hunting hdr 07 – North”, until 3am this morning, I woke up to find that it had been selected as “Image of the Day” by Parkesburg Today! 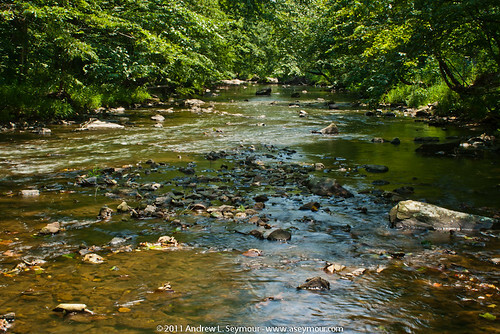 The Warm Brandywine Creeks… It is HOT! After packing up, and driving further West along Creek road in Glenmoore, I found my next little parking cove, and pulled in. The breeze from the drive helped, but it too was warm. 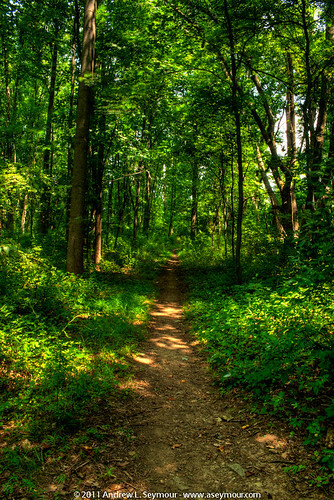 From the rear of my car, I gathered my gear, and started to walk back down the road, to find a path down to the creek. After a 100 feet or so, I climbed over the guard rail, down a small embankment, and stopped at the water’s edge to view my options. From where I was standing, it was a near perfect 90 degree bend in the creek, so I waded into the warm water and headed up. 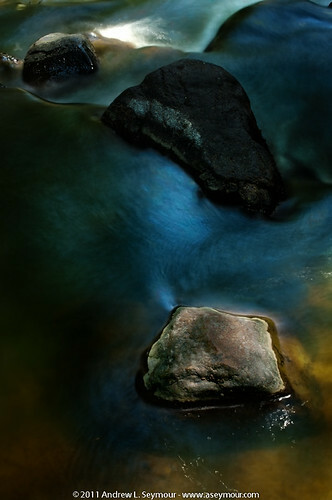 As I walked through the shallow water, I could easily see the creek bed rocks. I continued to walk further and further, until I finally reached a series of trees that had fallen over the creek, resting on the banks. In my heart, I wanted to continue. I could see deep shade on the other side, but it was too hot to be climbing over any trees today. Heading back down the creek, to near where I started, I exited the water and entered into the woods, seeing a potential short-cut to get further down the creek. 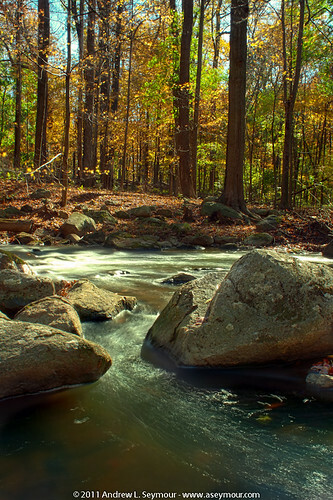 As I walked in through the woods, I kept my eye on the creek, looking for my next shot. I finally found an interesting area, and setup. I took several captures before taking the one at the top of the page, and it was the sun penetrating the water, revealing the details of the creek bed that I wanted to emphasis. After a few more clicks on the camera shutter, I looked at my watch, and started back to the car. There was one last place I wanted to try before calling it a day. At the car, I put my gear in the back, jumped in and headed further west to the spot that I had stopped and visited the night before. This time, there was an actual parking lot! 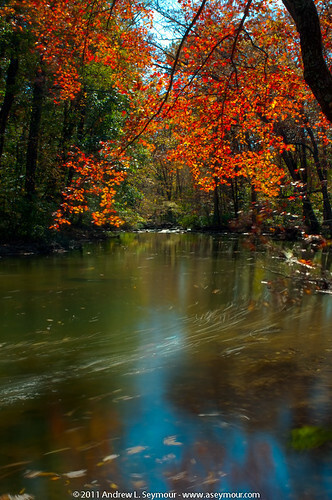 Once again, I gather my gear, and headed to the creek. As you can see from the first two pictures, this area of Chester County is dry, and the water levels are down several inches. During my visit the night before, I had taken note of the much large rocks in the creek, and I had been looking forward to doing some exploring with my camera. 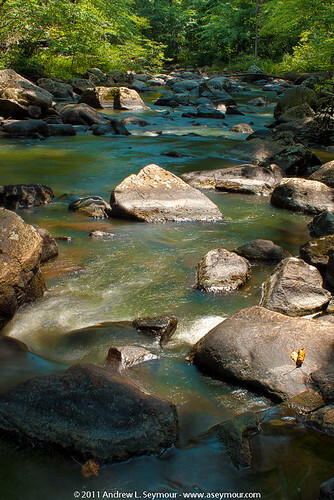 With the bigger rocks, it was also fun to bounce from rock to rock, trying to find scenes to photograph. I was also very apparent how low the water table was by looking at the levels on the larger rocks. In the “Trail Head” image, you can see several lines on the rocks. I setup and took a number of another shots, including this close-up detail of the top region of a small waterfall, “Water Cooled at 101° F”. Looking around some more, I made a metal notes on areas I wanted to return to in the cooler Fall days when the tree are in full color. Once again, I looked at my watch, and started back to the car. It was also nice to consider that there was a pool at my next stop! I was very ready to for this! Finally, I got a day to myself to go on a photo-walk! On my drive out to my sister’s last night to drop off Madison, I got a chance to do some drive-by scouting of the various areas along the Brandywine Creek that I wanted to try the following day. Later in that night, I spent some time using Google Earth to further explore my options, and also figured out a potential route to the Quarry! I spent the morning getting work related things out-of-the-way, and finally just after noon, I was walking out the door. Pow! – The heat and humidity smacked me in the face! I should have known better – Earlier, when I had been checking Facebook, several friends had already been posting that the weather outside was really bad. 20/20 Vision – On Wednesday morning, when we first looked out the windows, we though we saw fog, but in reality, it was the thick humidity of a new day! The drive to Marsh Creek Speedway was not that bad, but that because I had ALL the windows down! This was a HOT DAY! As I moved up creek, I noticed a parked car above me, by no easy path up, so I continued. After about 150 feet, I found something that looked like a path and followed it up, until I reached a surprising dirt vehicle road. I headed in the direction of the car, and finally came to an open area, where a light blue car was parked, along with a beach chair and a large thermos container. Then I noticed an older women dressed in a Security Guard’s uniform, backing out of the car, on the edges of nowhere. We both said hello, and started to talk about how hot it was. Turns out she is about to retire at the beginning of August, and she was within her last few days of sitting in the heat! After some time, I asked her which of the trails lead to the Quarry. She pointed to one trail, and said that it was the main entrance, but because it was Private Property, there was no access. She then pointed back down the dirt road I had just emerged from, and said that if I head back far enough, there was a trail that went off to the right. She also warned that there had been a lot of snakes reported, and there was a Mountain Biking team using the trails in preparation for an event. We chatted a little more, and I started back down the vehicle trail. I passed the spot from where I started, and continued walking till I reached the split in the road, and headed right. The trail started up a hill, and just seemed to continue. After a while, it leveled off a bit, and turn into a young growth area, with no trees thicker then 3 inches. Then it was back to the woods, and up more hill, and soon begin to see the fence that will be at my side for the rest of my trip. Finally, I reached a corner, where I stopped and rested, and during my rest, I noticed that there is a gated opening, which a small vehicle might be able to get through. I also noticed, that someone or some group of people already tried to gain access through this particular gate. 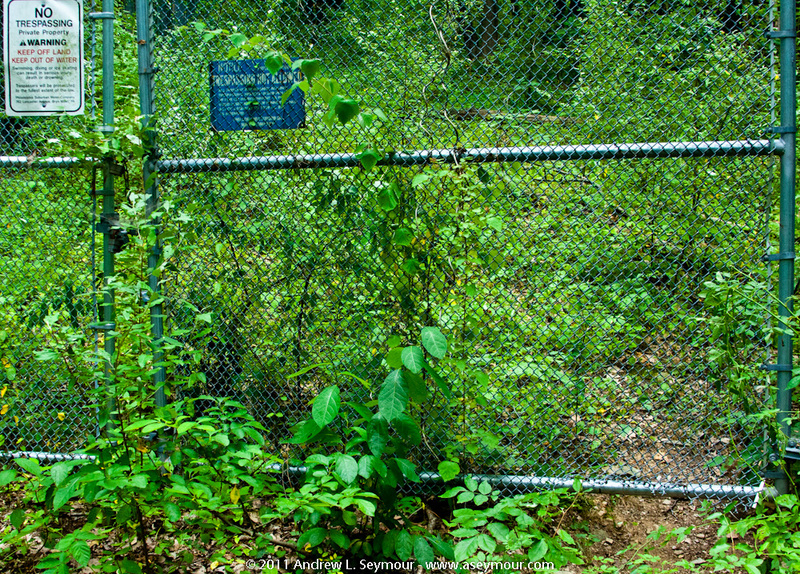 Question – Have you ever knowing crossed a ‘fence’ to obtain an image? Looking at the gap, I did contemplate trying to crawl under, but with the excessive heat and agility not in my favor, I decided not to pursue this avenue. After my break, I started back up the hill and finally reached the trail head. 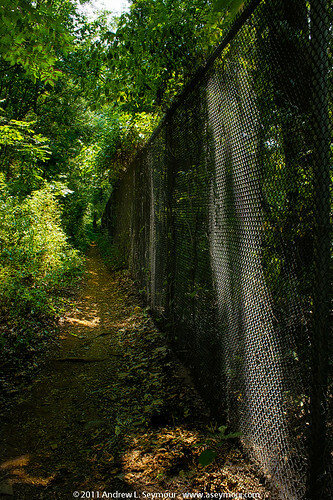 From my previous nights investigations, I knew that this trail led into the main part of Marsh Creek State Park. As I rested, I listened into the woods for any sounds that might be the mountain biking group, or anything else. Looking up into canopy of green leaves, I was rather amused to notice, as I drank my water and rested, a group birds circling my location. I captured a few more images, drank some more water, realized I was three-quarters empty, and started to head back down the hill. The walk back down the hill was rather uneventful – I did not even see a snake my entire hike! At the car, I removed my vest, which was already several shades darker from wetness and my tripod, and placed them both in the back of my car, hoping that the air generated by my open windows while driving, might dry the vest off, as I headed to my next location. 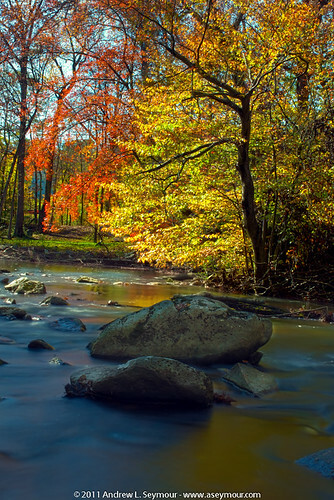 Off to my next point-of-interest (POI) along the Brandywine on Creek Road! 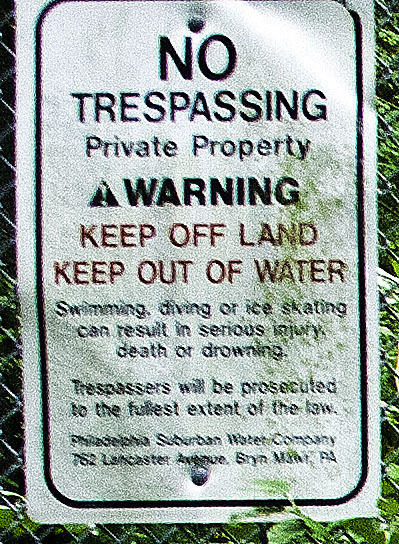 and according to the picture I took last year, as noted in this blog, the quarry is owned by Philadelphia Suburban Water Company in Bryn Mawr, PA, which can be seen in this extreme close-up of the fence.